35mm PL lens mount allows for the world's finest optics. Modular design gives us the option to upgrade it with new features, firmware, and accessories. The RED is 5 times better than a normal high-end HD camera. The Mysterium Super 35mm cin sized sensor lets us shoot at 30, 60, and 120 fps. In other words, the video resolution can rightfully be called "ultra high definition." Wide dynamic range and color space in 12 bit native RAW. Its lightweight can be used for electronic field production or to shoot feature films. Low noise, great dynamic range, and color fidelity features are comparable to a real 35mm film camera. RED LCD and EVD monitors allow for advanced tools for framing, exposure, and focus. Records directly to Compact Flash, in-camera, RED Flash Drive or RED Drive. 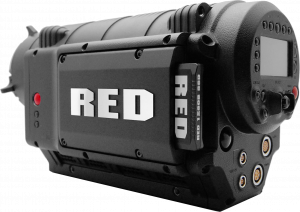 The RED supports down-sampling to 1080p for non-linear editing compatibility.